I've come across some halloween treats this week and want to share. 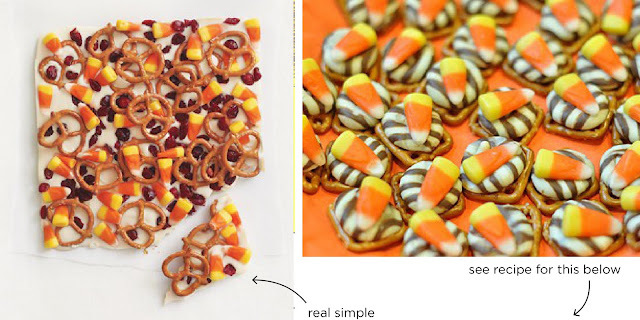 They are both super easy and include candy corn. Nothing to lose. For the pretzels you need Hershey's Hugs, pretzels, and candy corn! Arrange all the pretzels on a baking sheet and preheat the oven to 350. Unwrap as many Hugs as you have pretzels and place them on top of the pretzels. Put them in the oven for 3-5 minutes, until the Hugs are soft enough to push down with a candy corn. Smush a candy corn down on each one and then try not to eat them all. They are literally the perfect salty/sweet snack.